Review of Fantome Printemps | Beer Apprentice - Craft Beer News, Reviews, Interviews and Info. Hello everyone. For today’s craft beer review I’m going to be trying another beer from one of my favorite brewers. 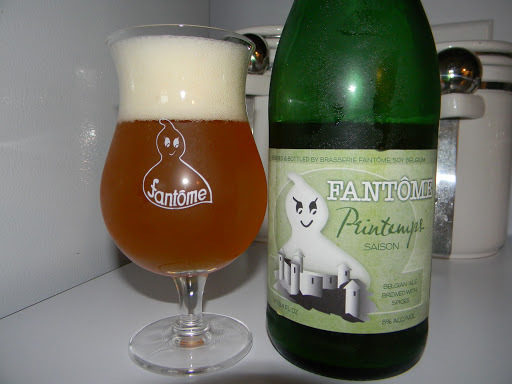 Today’s tasting is of the Fantome Printemps developed by the Brasserie Fantome located in Soy, Belgium. I’m really looking forward to trying this brew. Again, we are going to have to revert back to ratebeer.com for the commercial description. However, if you can translate French be sure to check out the Fantome website, fantome.be, sometime. Light, fruity and champagne-like. Fantôme brews special seasonal beers, never repeating a recipe from year to year. This one is for spring . . .
I’m excited to say the least. Let’s drink. This brew came in a 25.4 oz. bottle and it had an ABV of 8.0%. It poured a hazy to golden/orange color with a white head that was very soft, fluffy, soapy and rocky. It was sized very well and the retention time was very, very good. The lacing looked rather solid too. A lot of patchwork was left covering the sides of the snifter. The nose presented some yeast as well as some light floral and fruity notes. Hints of lemon and lemongrass. It began with a very moderate amount of funk, however it became way more prevalent as it began to warm. It revealed some earthy and woody tones that really peaked my interest too. A solid dose of relaxed spices made their way through also. All around a very pleasing and well balanced bouquet with this one I thought. The taste seemed to be even more entertaining and complex than the nose. Tones of delightful musty funk along with a very earthy and herbal touch. Spicy coriander and light pepper gave it some additional bite whilst subtle citrus of lemon and orange added some sweetness. A modest amount of breadiness along with a minor tickle of grassy hops completed the flavor profile. Very nice. The mouthfeel was medium bodied. Smooth, dry, kind of crisp and somewhat refreshing. The carbonation was spot on and a small bit of warmth was felt from both the spice and the alcohol. The palate was left drenched with a good deal of flavor for me to enjoy between sips. Well, this is another very good and well made beer by Fantome. Definitely worth a try if you favor Saisons. The drinkability was outstanding because I made my way through the bottle in no time flat. I should have picked up another one. I don’t know that it’s quite as “loud” as some of the other Fantome beers, however it’s just as complex. I’m guessing that because it’s a Spring seasonal has a lot to do with it being a touch lighter. I, however, tried it back in the Summer and found it to be quite fitting for that time of year as well. So, if you guys happen to see the Fantome Printemps next Spring at your bottle shop, pick it up and give it a go. I think you may really enjoy it.